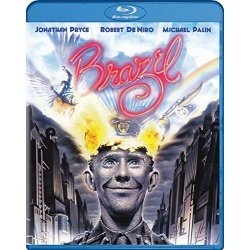 Jonathan Pryce (Pirates Of The Caribbean), Robert De Niro (The Godfather) and Michael Palin (Monty Python And The Holy Grail) star in this landmark cult classic that dazzles and thrills with its Academy Award nominated groundbreaking art direction and sharply satirical original screenplay. In a future world, a government clerk finds his life destroyed when he tries to correct an administrative error that caused a massive chain reaction of mistaken identity, Despite his efforts, he finds himself an enemy of the state. Hailed as a modern masterpiece, visionary director Terry Gilliam's (Fear And Loathing In Las Vegas) pitch-black comedy takes a highly imaginative and chilling look at a "perfect" future where technology reigns supreme and bureaucracy overrules love for the sake of efficiency.